Victor Moscoso, (born, 1936 in Oleiros, Galicia, Spain) Moscoso was the first of the rock poster artists of the 1960s era with formal academic training and experience. After studying art at Cooper Union in New York City and at Yale University, he moved to San Francisco in 1959. There, he attended the San Francisco Art Institute, where he eventually became an instructor. After landing in the Haight at the genesis of the counterculture, Moscoso was hesitant to jump on the poster art bandwagon. To get in the game, he had to forget everything he had learned in art school about conventional graphic design. "I was trying to make the lettering legible," he recalled. "I was trying to get the message across quickly and simply. Because I was such a good student and learned the rules of good poster making, I was doing all the wrong things." The psychedelic form was to create posters that were nearly illegible, keeping the viewer as engaged (or confused) for as long as possible. "Mouse and Kelley had come along and done the 'Zig Zag Man' poster and it knocked my socks off," Moscoso remembered. "It floored me. It was like Bob Dylan's The Ballad of The Thin Man. ‘Something is happening here and you don't know what it is,’ do you, Victor?'" But it didn't take Moscoso long to catch on. "I got hip to the trip right away," he said about bringing his own vision to the scene. "I feel he was trying to cast off his New York slickness and fit into a more funky style," recalled Stanley Mouse, who liked Moscoso's "Quick and the Dead" poster for a 1966 Grateful Dead/Quicksilver Messenger Service concert so much that he framed it and hung it over his wood stove. The poster artists used mechanical techniques that involved tracing art nouveau and antique images and using overlays of vibrating colors during the printing process. Mouse remembers that Moscoso was particularly adept at taking electric colors and arranging them in ways that made his posters look as if the images were moving on the paper. "He would actually get animation going in the way he used reds, yellows and blues," Mouse explained. "Victor did some really involved positive and negative overlays that would escape most peoples' mental abilities. And he had a fine hand that was technical and masterful and that not many people possess." Moscoso was the first of San Francisco’s “Big Five” psychedelic poster artists to create his own poster series. He named it Neon Rose. 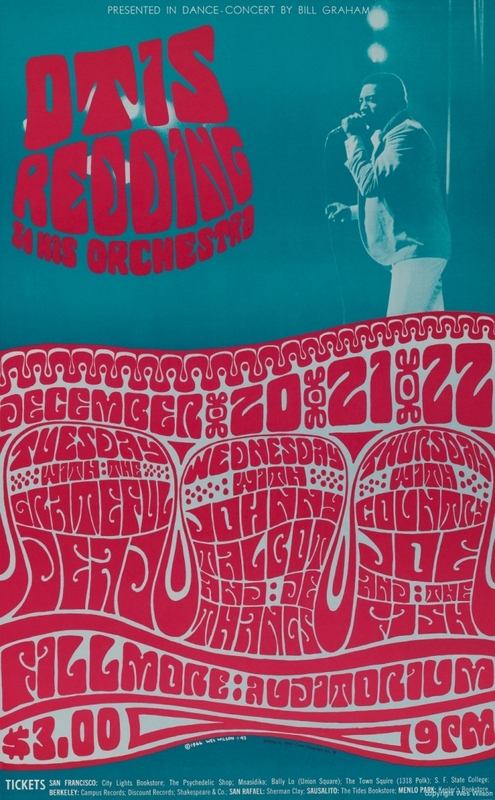 Moscoso had approached the owners of The Matrix (the San Francisco rock club where major bands like The Doors, Jefferson Airplane, and Big Brother & The Holding Company played), offering to give the club 200 free posters for each Matrix show if he could print as many others as he could afford, and sell them. They took the deal. Victor Moscoso also was the first of the Big Five to have his posters shown in the Museum of Modern Art in New York. His work is in the Victoria and Albert Museum in London, and in the Library of Congress. The Neon Rose Series of posters is one of the crown jewels of the psychedelic poster era.